India are well and truly among the top 2-3 teams who are fancied to win the ICC Cricket World Cup to be played in England and Wales later on this year. Their balance, the depth of their bench reserves and the confidence and perseverance of their bowling unit make them strong, formidable looking unit ahead of the marquee tournament. As a team, they created history by becoming the first ever Asian team to win a series down- under by defeating Australia 2-1. They followed that up with a convincing ODI series, again a first for India as an ODI team. The previous ODI series win saw the return of MS Dhoni, the finisher. As his batting was instrumental in scripting India's historic series win down-under. Overall, the team seemed confident and almost every box seemed to be checked heading into the ICC Cricket World Cup. The dominance and the nature of the team's performance in the first three ODIs was definitely pleasing to the eyes, but the nature of defeat at Hamilton bought back some old wounds and concerns from an Indian perspective. India have been very convincing in the past 12-15 months and series win in Australia, South Africa and New Zealand speaks for themselves. But with them looking so good and with many experts and pundits terming India as favourites to win the ICC Cricket World Cup, they would need to iron out and address some concerns in order to head into the tournament much stronger. Here's looking at some of the issues and concerns that India need to look at sorting out. India have been dominant and have posted some commanding totals and have been equally potent at chasing totals with elan in the past 15-18 months. But one constant factor in that success have been the performance of their top three batsmen Rohit Sharma, Shikhar Dhawan and Virat Kohli. The majority of India's success is directly linked to the runs amassed by the top three batsmen. 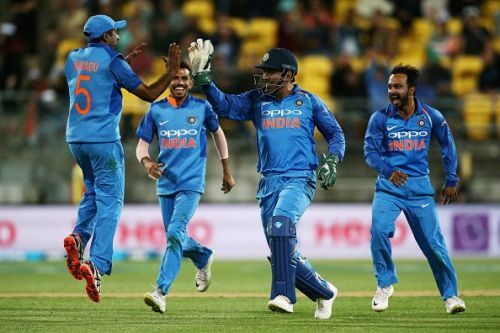 Now in conditions that suit batsmen, even if the openers fail to deliver, this middle order comprising Ambati Rayudu, Kedhar Jadhav, MS Dhoni, Hardik Pandya and Dinesh Karthik can own up and propel India forward. But if the ball is moving around and the bowlers have a fair say, this Indian batting lineup has looked out of sorts. Classic examples of this is the manner in which the top three capitulated in Hamilton and Wellington. The bowling from Trent Boult and Matt Henry was fantastic but the lack of intent to play out the tough balls and some loose shots led to their dismissals. Not every game can three batsmen continuously deliver for the team. The middle order must own up, take responsibility and help out. The manner in which Ambati Rayudu, Vijay Shankar and finally Hardik Pandya completed a rescue act for India in the fifth ODI is definitely pleasing signs. But the concerning fact is India have been far too reliant on their fabulous top three batsmen and what they would hope is this performance at Wellington can lead to more middle order runs in the coming games. ICC World Cup 2019: Who are the biggest game-changers for New Zealand?